STARKVILLE, Miss. (AP) — Dak Prescott ran for two touchdowns and threw for another, leading No. 3 Mississippi State to a 38-23 victory over No. 2 Auburn on Saturday. Mississippi State (6-0, 3-0 Southeastern Conference) has won nine straight games going back to last season. Auburn (5-1, 2-1), the defending SEC champion, lost for the first time since last season’s national championship game. The Bulldogs took a 21-0 lead in the first nine minutes, but Auburn pulled to 28-20 in the third quarter. The Tigers couldn’t complete the comeback, though, undone by Ricardo Louis’ fumble in the fourth quarter, untimely penalties and an inconsistent offense. Prescott completed 18 of 34 passes for 246 yards and also rushed for 121 yards. He threw two interceptions. Auburn’s Nick Marshall threw for 209 yards, two touchdowns and two interceptions while also running for 100 yards. Mississippi State won despite committing four turnovers. The Bulldogs will find out on Sunday if the victory was enough to jump Florida State and earn the first No. 1 national ranking in school history. Florida State defeated Syracuse 38-20 on Saturday. It was Prescott’s first game since a breakout performance against Texas A&M. For the most part, the 6-foot-2, 230-pound junior has handled the increased scrutiny well, making plays with both his arm and feet. He also had lots of help. Josh Robinson ran for 97 yards and two touchdowns, De’Runnya Wilson caught four passes for 72 yards, including a 34-yard touchdown catch. And the Bulldogs defense bailed out the offense with red zone stops following turnovers. Mississippi State jumped out to a 21-0 lead in the first nine minutes thanks to Prescott, Wilson and an Auburn offense that had a rough start. The Tigers had two turnovers on their first two offensive plays. The first was when Marshall’s pass was tipped at the line of scrimmage and intercepted by Jay Hughes. The second was a fumble by receiver D’haquille Williams that was recovered by Benardrick McKinney. Mississippi State turned them both into touchdowns. A few minutes later, Prescott rumbled into the end zone for a 2-yard touchdown and the Bulldogs — who were hosting their first game between top five teams in school history — got their fan base going as they celebrated a 21-0 lead. But then it was Mississippi State’s turn to start committing turnovers, with four before halftime. The Bulldogs threw three interceptions — including two by Prescott and one by Logan Cooke on an ill-fated fake punt — and Jamoral Graham fumbled on a punt return. 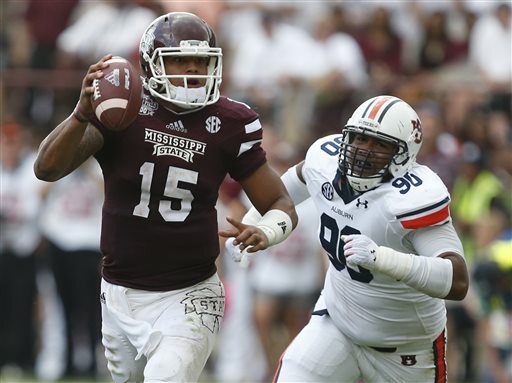 Mississippi State’s defense did the job despite Auburn’s good field position. The Bulldogs held Auburn to two field goals before Marshall completed a 9-yard pass to Williams to pull the Tigers within 21-13. That quieted the cowbells for a few minutes, but they roared again late in the second quarter when Prescott ran for a 15-yard touchdown and a 28-13 lead. That’s about the time rain came to Davis Wade Stadium, making offense for both teams more difficult to sustain. Auburn pulled within 28-20 on an impressive 10-play, 99-yard touchdown drive midway through the third quarter that was capped by Marshall’s 15-yard throw to Williams for the score. But as the rain continued in the second half, Marshall’s passes started sailing high and the Tigers lost momentum. Mississippi State went ahead 31-20 on a 21-yard field goal with 11:33 remaining. On the ensuing kickoff, Louis fumbled and the Bulldogs recovered. Two plays later, Robinson ran for a 1-yard touchdown and the celebration began in Starkville.